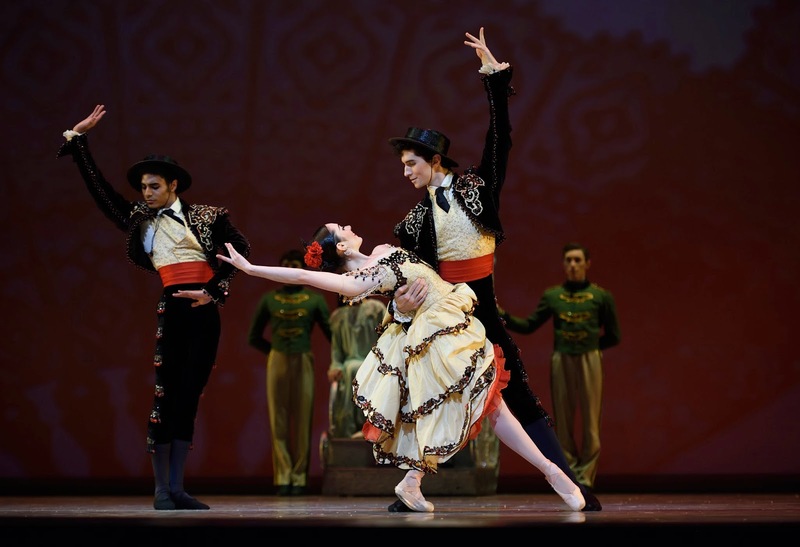 As the house lights dimmed in the War Memorial Opera House and the orchestra hit the first notes of the overture, an annual holiday tradition was underway – San Francisco Ballet in Artistic Director Helgi Tomasson’s Nutcracker. In past reviews of this wonderful version of the Nutcracker, I’ve commented on a number of different topics: the progression of the narrative arc, titles roles, specific scenes and Act II’s solo divertissements. What struck me this year was how Tomasson’s Nutcracker really celebrates the entire San Francisco Ballet family. From the school’s students to Principal Character portrayals to corps dancers performing featured roles, Tomasson’s Nutcracker holds the ‘whole’ of this impeccable artistic institution, one brimming with creative and technical acumen. The special added excitement that comes from opening night pulsed from beginning to end. Act I’s dancing dolls personified that energy and drive, particularly Wei Wang with sparkling parallel sissones and jumps that changed diagonal with the utmost precision. As the Nutcracker Prince, Davit Karapetyan was the picture of courtliness. His first variation defied gravity, soaring through the air with every grand jeté entralace. Jennifer Stahl and Luke Ingham were wintery perfection as the Queen and King of the Snow. More than any other pair I’ve seen, the two were able to make the transition into the snow scene (which can feel a little abrupt) regally seamless. And Stahl, a soloist in the company, had a fantastic turn in a role often danced by one of the Principals – her final circuit of Russian pas de chats, fouettés and turning relevés were spectacular. By the end of the snow scene, there is quite a blizzard on stage, and this year, there seemed to be some additional weather in the mix. The snow was abundantly falling from above, but it looked like there was wind blowing from the sides of the stage as well, creating blustery circles. Bravi to the entire cast for braving the icy elements! Act II’s Spanish pas de cinq, all corps de ballet dancers, was the best I’ve seen. This is a short variation and with five dancers, it can get a little cluttered, but this particular quintet had both technical unity and fitting style. The Arabian trio was equally impressive. Even with difficult turns that end in extended arabesque (and also have very little preparation), Gaetano Amico and Daniel Deivison-Oliveira nailed every single step, and WanTing Zhao shone with serpentine sinuousness. In the Chinese divertissement, Lonnie Weeks brought precision and lightness to the stage. The French pas followed, a lengthy variation for three women, who also have to maneuver hand-held ribbons. Corps members Rebecca Rhodes, Maggie Weirich and Ami Yuki accomplished their task handily, though spacing proved challenging from time to time. And corps dancer Esteban Hernandez led the Russian pas de trois with Francisco Sebastião and Blake Kessler, both apprentices with the company. This sequence has historically had some powerhouse dancers in its leading role (Pascal Molat, Hansuke Yamamoto and more recently Wei Wang) and these three men rose to the occasion, especially when they returned in the reprise section. Hernandez’s opening jump drew elated gasps from the audience. The Waltzing Flowers sequence (led with beauty and grace at this performance by Sugar Plum Fairy Vanessa Zahorian) is one of the most beautiful scenes in Tomasson’s Nutcracker, full of lovely and charming choreography. While nothing went awry last night, something did seem a little off during the scene. I couldn’t quite figure out what the missing piece was. As the Nutcracker entered its final chapter, the grand pas de deux, solos and coda claimed the stage. Karapetyan’s variation was truly gallant, in every sense of the word. And though it is still a little strange to see a grown-up Clara (Frances Chung at this performance) dance to the music that bears the Sugar Plum Fairy’s name, the piece is entrancing. Imaginative and unexpected turns and relevés abound and Chung delivered one hundred per cent.